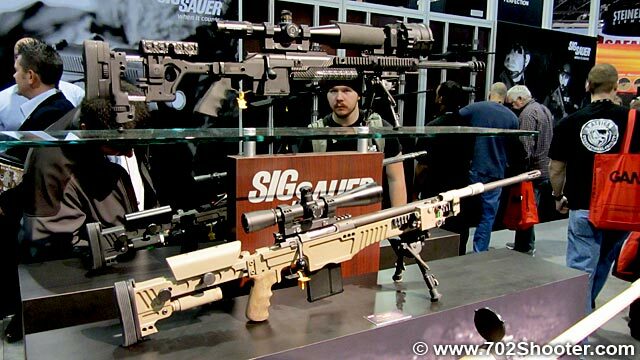 The guys at the Sig Sauer booth really went out of their way to show me all their cool new stuff. I was first introduced to Scott Kenneson who showed me their new ACP or Adaptive Carbine Platform. The ACP is similar to products like the Roni but it accepts almost any standard size handgun with a rail so you are not stuck with a single gun type. Sig, Glock, Springfield XD, and even 1911’s will work in this new platform. It is a little bulkier than most but it’s also better quality and offers more options. 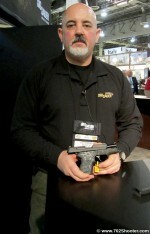 Scott then showed me the new P224 and P938 pistols. The P224 is compact version of the standard Sig type handguns. 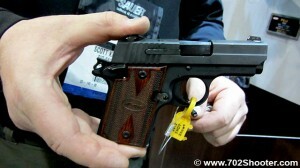 It is offered in 9mm, .40 S&W, and .357 Sig with a 10+ 1 capacity. It comes in various finishes different grip options. The P938 is basically a slightly larger 9mm version of the P238 .380 they introduced in 2011. Just like the P238 and new P224, it has multiple finish and grip configurations. After Scott wrapped up the new handguns, he introduced me to Jarrod McDevitt who went over their new 716 .308 and also the 556xi which is the next generation of their 556 platform. It’s loaded with ambidextrous options and comes with a slimmer profile quad rail and the now standard Sig Sauer Swiss folding stock. Scott also went over their new SBR program which essentially means that they intend to offer an SBR variant of almost every model they have. Sig has also expanded their M400 line to include Magpul MOE furniture as well as a new SWAT model with their new 2 piece quad rail hand guard. Jarrod then handed me over to David Grimshaw who went over their .50 plus Sig’s latest 2 sniper rifles. All these guys worked together as a team and unlike a lot of the reps I talked with, they actually appeared to enjoy their jobs and interacting with others. I don’t get why they didn’t go with a sturdier stock on the ACP… I would think an HK style sliding stock would be almost as light, but way more rigid.